Sewall Joseph, D. D. was the son of the Hon. Samuel Sewall, Esq. chief justice of the province. He was graduated at Harvard College, 1707, and was ordained as colleague with the Rev. 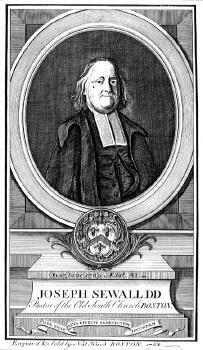 Mr. Pemberton, pastor of the old south church, Sept. 16, 1713. For many years he continued to preach to this people, who were edified, instructed and comforted by his labours. He was a man who seemed to breathe the air of heaven, while he was here upon earth; he delighted in the work of the ministry; and when he grew venerable for his age, as well as his piety, he was regarded as the father of the clergy. The rising generation looked upon him with reverence, and all classes of people felt a respect for his name. He was a genuine disciple of the famous John Calvin. He dwelt upon the great articles of the Christian faith in preaching and conversation; and dreaded the propagation of any opinions in this country, which were contrary to the principles of our fathers. Hence he was no friend to free inquiries, or to any discussion of theological opinions, which were held true by the first reformers. His advice to students in divinity was, to read the Bible always with a comment, such as Mr. Henry's, or Archbishop Usher's, and to make themselves acquainted with the work of his great predecessor, Mr. Willard, whose body of divinity was then in great repute. Though he so often preached the doctrines of the gospel, yet he never entered into any curious speculations; his object was to impress upon people what they should believe, and how they must live to be eternally happy. His sermons were pathetick [emotional], and the pious strains of his prayers, as well as preaching, excited serious attention, and made a devout assembly. His character was uniform, and the observation has often been made, if he entered into company something serious or good dropt from his lips. "His very presence banished away every thing of levity, and solemnized the minds of all those who were with him." He received the degree of doctor of divinity from the university of Glasgow, in the year 1731; and was appointed a corresponding member of "the society in Scotland for promoting Christian knowledge." He was also appointed one of the commissioners, by the hon. corporation in London, "for the propagation of the gospel in New England, and parts adjacent." Although Dr. Sewall was more remarkable for his piety than his learning, yet he was a friend to literature, and endeavoured all in his power to promote the interest and reputation of the college. He was a very good classical scholar. He could write handsomely in Latin when he was an old man, and had read many authors in that language. Most of the works of the great divines of the preceding century were written in Latin, as it was a kind of universal language among the literati of Europe. In the year 1724, upon the decease of Mr. Leveret, Dr. Sewall was chosen to succeed him as president of Harvard College, which honourable station he did not see fit to accept. In 1728, upon Dr. Colman's resignation, he was chosen a fellow of the corporation, and he faithfully discharged the duties of this office, till the year 1765. His donation to the college of money to be appropriated to indigent scholars, has been of considerable use. He gave this during his life, and was among the first to repair the loss of the library, when Harvard Hall was consumed by fire, by making a present of many valuable books. This devout man also gave much alms to the people. He possessed an estate beyond any of his brethren; but he always devoted a tenth part of his income to pious and charitable uses. It pleased the Lord of life to bless him with health, as well as other means of enjoyment. He lived to a good old age; and preached to his people the evening he had arrived at fourscore years. The next Sabbath he was seized with a paralytical complaint, which confined him some months, and he died, June 27th, 1769, in the 81st year of his age. [S3] Nina Moore Tiffany, Samuel E. Sewell: a memoir, p.5. [S7] Clifford K. Shipton, Biographical Sketches, 1701-1712. [S18] Various editors, Biographical Dictionary of Notable Americans, Vol. 9, p. 210. [S7] Clifford K. Shipton, Biographical Sketches, 1701-1712, p.376. [S83] NEHGR, Vol. 46 p. 4. [S7] Clifford K. Shipton, Biographical Sketches, 1701-1712, p.382. [S130] Massachusetts Vital Records, Marriages in Boston, 1700-1809. [S587] John Eliot, New England Biographical Dictionary, p. 422. [S7] Clifford K. Shipton, Biographical Sketches, 1701-1712, p.390. On September 5 1877, the new University of Colorado opened in Boulder. 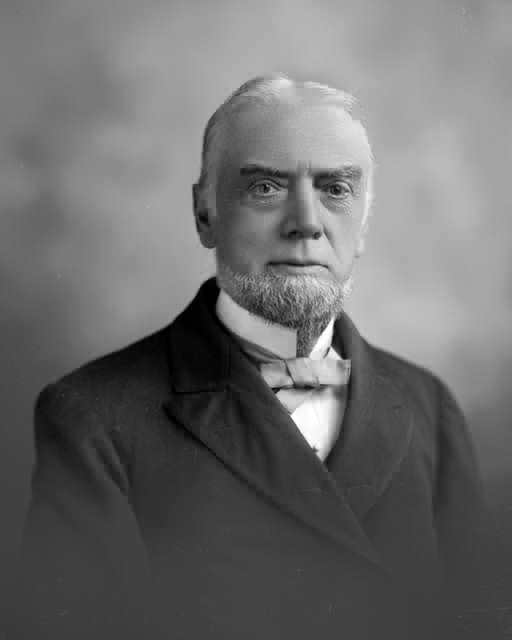 University President Joseph Addison Sewall. MD. and his daughter. Ann M. Sewall. his assistant, led 44 students in a procession. Governor John L Routt and the University trustees—along with a parade of local citizens, firemen. Masons, and a brass band—rode from the town to the new campus for the opening ceremonies. Three-story "Old Main,” the only University building, also housed a preparatory high school. Dr and Mrs. Sewall and their two daughters lived in the northwest part of the first floor of Old Main. [S232] Ancestry.com, Illinois, Marriages, 1851-1900. [S205] Newspaper, Reno Evening Gazette, Reno, Nevada, Friday, January 19, 1917. Page 6. [S392] Website findagrave.com (http://www.findagrave.com/) "# 11096321." [S107] 1880 US Census, Boulder, Colorado. [S207] 1910 US Census, Ward 13, Denver, Colorado. [S205] Newspaper, The Portsmouth, N.H. Herald, 17 September 1942. [S107] 1880 US Census, York, Maine. [S364] Eben Graves, The descendants of Henry Sewall. Vol. II (Unpublished), #268. [S392] Website findagrave.com (http://www.findagrave.com/) "# 37434522." [S595] James Kerr Sewall, Clement Sewall, p. 9. [S208] 1900 US Census, Washington, District of Columbia. [S392] Website findagrave.com (http://www.findagrave.com/) "# 82777826." [S392] Website findagrave.com (http://www.findagrave.com/) "# 82777826 quoted by Mr. Kenneth Fawcett." Joseph Crosby Sewall was born on 17 October 1892 in Manhattan, New York.2,3 He was the son of Elbridge Cushman Sewall and Jessie Benton Mead.2 Joseph Crosby Sewall married Gertrude Williams, daughter of John Maxwell Williams, on 17 February 1917 in New York.4 Joseph Crosby Sewall was employed by F.M. Dyer as a bond salesman in 1918 at New York City.1 He is said to have died circa 1945. [S207] 1910 US Census, Manhattan Ward 12, New York, New York. [S232] Ancestry.com, New York City Births, 1891-1902. [S160] New York Times, 18 February 1917. [S231] 1930 US Census, Montclair, Essex, New Jersey. [S207] 1910 US Census, Weymouth Ward, Norfolk, Masachusetts. [S232] Ancestry.com, U.S. World War II Draft Registration Cards, 1942. [S216] Anon, Graduates of Bowdoin College, p. 428. [S392] Website findagrave.com (http://www.findagrave.com/) "# 45126958." [S107] 1880 US Census, Ward 7, Bath, Sagadahoc, Maine. [S207] 1910 US Census, MAINE, SAGADAHOC, 6-WD BATH. [S392] Website findagrave.com (http://www.findagrave.com/) "# 45126748." [S231] 1930 US Census, York, York, Maine. [S232] Ancestry.com, New Hampshire, Death and Disinterment Records, 1754-1947. [S392] Website findagrave.com (http://www.findagrave.com/) "# 181825921." [S24] Sarah Elizabeth Titcomb, Early New England People, p. 223. [S83] NEHGR, Vol. 74 p. 203. [S205] Newspaper, Columbian Centinel, 29 September 1813. [S89] Family Search, United States Veterans Administration Pension Payment Cards, 1907-1933. [S153] Charles Nelson Sinnett, Sinnett's Sewall genealogy, p. 61. [S208] 1900 US Census, MAINE, HANCOCK, BUCKSPORT. [S89] Family Search, Record of marriages in Penobscot County, Maine, 1827-1888. [S89] Family Search, Town and vital records 1819-1891 Bangor (Maine). [S205] Newspaper, Boston Daily Advertiser, (Boston, MA) Tuesday, May 22, 1855. [S107] 1880 US Census, Bucksport, Hancock, Maine. [S232] Ancestry.com, Maine, Death Records, 1617-1922 Record for Henry Sewell. [S205] Newspaper, Bar Harbor Record, June 20 1900. [S232] Ancestry.com, Maine, Death Records, 1617-1922. [S392] Website findagrave.com (http://www.findagrave.com/) "# 53362135." [S89] Family Search, Massachusetts, Marriages, 1695-1910. [S364] Eben Graves, The descendants of Henry Sewall. Vol. II (Unpublished), #168. [S231] 1930 US Census, Los Angeles (Districts 0001-0250), California. [S585] 1940 US Census, San Francisco City, Assembly District 26. [S232] Ancestry.com, U.S. WWII Draft Cards Young Men, 1940-1947. Joseph O. Sewall Sr., 74, of 3 Farragut Rd., died today (Aug. 27, 1965) in Muhlenberg Hospital, where he had been a patient for three weeks. Born in Evanstown, Ill., he had lived in South Plainfield for 30 years before moving to his late address four years ago. He was retired from the Small Arms Department of the Raritan Arsenal, where he had been employed for 15 years. He was the husband of the late Mary Bremble Sewall, and a Navy veteran of World War 1. He is survived by a son, Joseph O. Sewall Jr. of Plain-field; three daughters, Mrs. Lida S. Baehr and Miss Eva L. Sewall, both at home, and Mrs. William W. McGhee of Thousand Oaks, Calif; two sisters, Miss Mary Sewall of Pacific Grove, Calif., and Mrs. Ruth Payne of Cambridge, Md; and four grandchildren. [S232] Ancestry.com, U.S., World War II Draft Registration Cards, 1942. [S205] Newspaper, The Courier-News (Bridgewater, New Jersey), 27 August 1965. [S585] 1940 US Census, South Plainfield, Middlesex, New Jersey. [S153] Charles Nelson Sinnett, Sinnett's Sewall genealogy, p.12. [S130] Massachusetts Vital Records, Vol: 137 ; Page: 133. [S205] Newspaper, Boston Daily Advertiser, (Boston, MA) Thursday, December 27, 1860. [S89] Family Search, Minnesota, Marriages, 1849-1950. [S392] Website findagrave.com (http://www.findagrave.com/) "# 44514229." [S205] Newspaper, The Brainerd Daily Dispatch, 11 July 1961. [S34] Unverified internet information, http://www.digitalarchives.wa.gov Marriage certificate easpmca7281. [S231] 1930 US Census, Glendive, Dawson, Montana. [S205] Newspaper, Rocky Mountain News (CO) - April 4, 1993. [S585] 1940 US Census, Ward 10, St. Paul, St. Paul City, Ramsey, Minnesota,. [S184] Harrie B. Coe, Maine Biographies, p. 125. [S231] 1930 US Census, Boothbay Harbor, Lincoln, Maine. [S208] 1900 US Census, ME SAGADAHOC 6-WD BATH. [S232] Ancestry.com, Maine Military Men, 1917-1918. [S243] Maine State Archives, Maine Marriages 1892-1996. [S34] Unverified internet information, Maine Vital Records. Joseph Thompson Sewall Jr. was born on 6 December 1929 in Boothbay Harbor, Maine.2 He was the son of Joseph Thompson Sewall and Gara E. Dunton. Joseph Thompson Sewall Jr. was educated at Admiral Billard Academy, New London.1 He died on 19 July 1999 in Augusta, Maine, at the age of 69. "Joseph T. "Tom" Sewall Jr., 69, died Monday at the Maine Veteran's Home in Augusta. He was born here, a son of Joseph T. and Gara Dunton Sewall, attended local schools and graduated from Boothbay Region High School in 1948. He served in the Army during the Korean War. Later, he was a yacht captain in Florida until he returned to live in Boothbay Harbor. He worked in local shipyards until accepting a position in the maintenance department of the Maine Department of Marine Resources. He retired in 1990. Surviving are his wife of 35 years, Marilynn Berry Sewall of Boothbay Harbor; two sons, Kenneth of Schroon Lake, N.Y., and James of Boothbay Harbor; one daughter, Janice Sewall of Boothbay Harbor; and five grandchildren. Visiting hours will be held from 6 to 8 p.m. today at Simmons, Harrington and Hall Funeral Home, Boothbay, where a funeral will be held at 2 p.m. Thursday with the Rev. Dan McNutt and Al Roberts officiating. Burial will be in Evergreen Cemetery, Boothbay." [S160] New York Times, 21 May 1957. [S205] Newspaper, Wiscassett Newspaper (Feb/14/2004). [S83] NEHGR, Vol. 113 p. 196. Vital Records of York, Maine. [S89] Family Search, Maine Deaths and Burials, 1841-1910. [S392] Website findagrave.com (http://www.findagrave.com/) "# 63787583." [S392] Website findagrave.com (http://www.findagrave.com/) "# 68406861." Joseph Sewall Jr., 28, of Old Town, Maine, son of Maine Senate President Joseph Sewall, died Friday after becoming ill at his job as a cook. A spokesman for the town marshal's office said there was no suspicion of foul play, but an autopsy was ordered for Saturday. The spokesman said Sewall was taken to the home of a friend where he appeared to recover. His body was found about 4 a.m. Officials would not speculate as to the cause of death. Greeley Daily Tribune, 21 December 1974. [S364] Eben Graves, The descendants of Henry Sewall. Vol. II (Unpublished), #671. [S205] Newspaper, Greeley Daily Tribune. December 21, 1974. [S153] Charles Nelson Sinnett, Sinnett's Sewall genealogy, p. 36. [S392] Website findagrave.com (http://www.findagrave.com/) "# 63063205." [S153] Charles Nelson Sinnett, Sinnett's Sewall genealogy, p. 56. [S392] Website findagrave.com (http://www.findagrave.com/) "# 119035959." [S89] Family Search, United States Border Crossings from Canada to United States, 1895-1956. [S349] Katharine Bagg Hastings, William James of Albany, p. 30. [S205] Newspaper, Watertown Daily Times, 20 September 1903. [S205] Newspaper, The Boston Herald, 6 July 1969. [S207] 1910 US Census, Massachusetts, Worcester, Worcester Ward 1, District 1854.